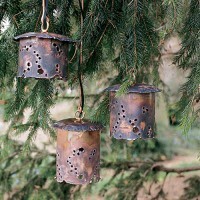 Aurora is fashioned after our popular hanging garden light. 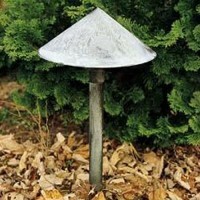 A petite fixture, this version is now..
Firefly has a conical reflector that will blend with most colonial applications. The natural copp.. 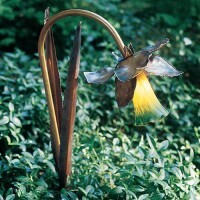 The Luxuriant was inspired by a meadow lily. 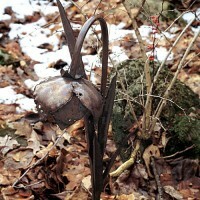 The leaves and flower are torch cut, yielding a natu.. The Narcissus is designed to resemble a daffodil. 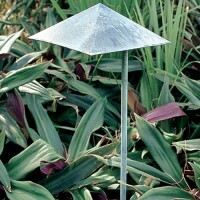 The petals are torch cut and hand formed to pro..
Pyramis is simple in design to enhance your walk or patio for evening. It's uncomplicated form bl.. 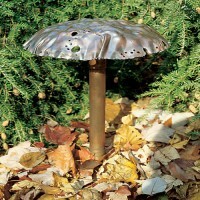 Toadstool fixtures feature a hand sculpted copper reflector. Artistic margins are burned with a t..